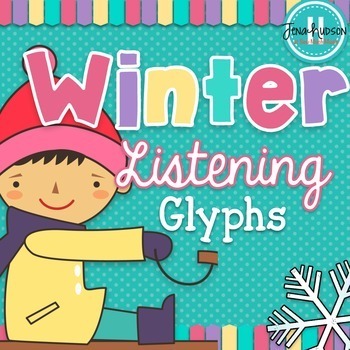 This set features 5 Winter-themed listening glyphs in two options. There are two options of each glyph. 1. Glyphs for younger students- features generic terms such as loud/quiet, fast/slow, singers/no singers, drummers/no drummers, and like/dislike. 2. Glyphs for older students- features music vocabulary such as forte/piano, adagio/allegro, percussion/no percussion, vocalist/ no vocalist, and likes/dislikes. 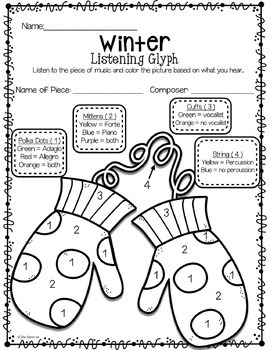 These glyphs can be used for ANY piece of music that you are studying in your music classroom! 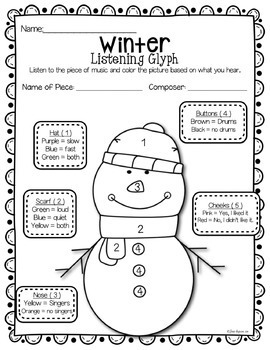 Simply play a piece of music while students color their picture according to what they hear. Listening suggestions are included in the file. 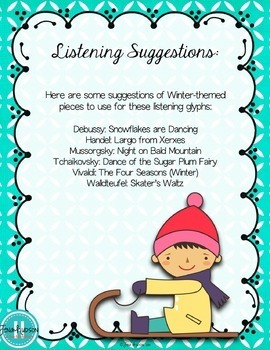 Want a listening glyph for every holiday? Check out my Listening Glyph Mega Bundle and save $6.00! Sew Much Music has a Facebook Page! Click "like" to follow along for lesson ideas, freebies, craft ideas, and new products. Thank you! All feedback is greatly appreciated. I love to hear from you!